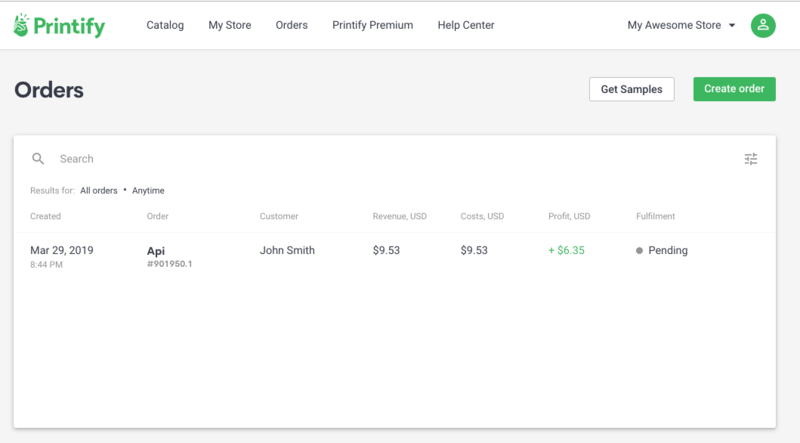 How do orders and products submitted through API look like inside my account? 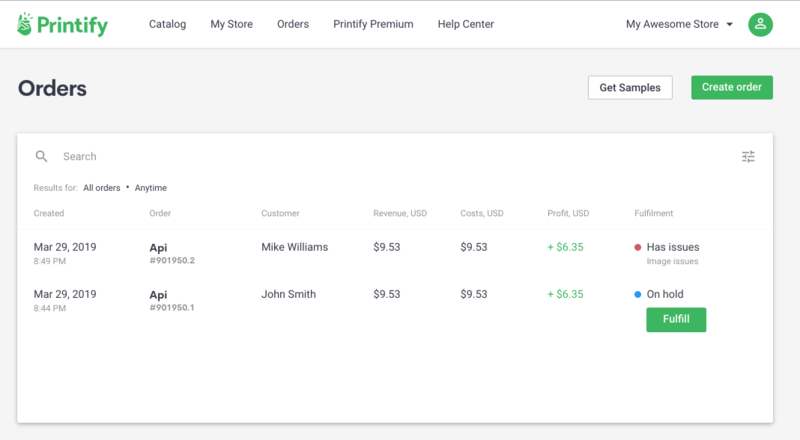 Find out how orders and products submitted through Printify API look like in the app. All orders submitted through API will have an "Api" label in the order list. Successfully submitted orders will move into "On hold" status and after that they will be sent to production according to your Order Approval settings. These settings are located in your store settings under the "Preferences" tab. Here is an article that shows where to find these settings. You could also encounter some orders that are in "Pending" status. However, this will rarely happen. Pending status means that there are some background processes that are still running. This usually takes only a few seconds, but could take up to a few minutes in case the submitted image for the order has a large file size or if the supplied image URL is not accessible while our system tries to download the image from it. Occasionally, you might also see that orders submitted through API have issues, namely, image issues. Such orders will be in "Has issues" status. We couldn't download the image from the image URL supplied when the order was submitted. The image was downloaded successfully, but it had a low resolution (less than 100 DPI). 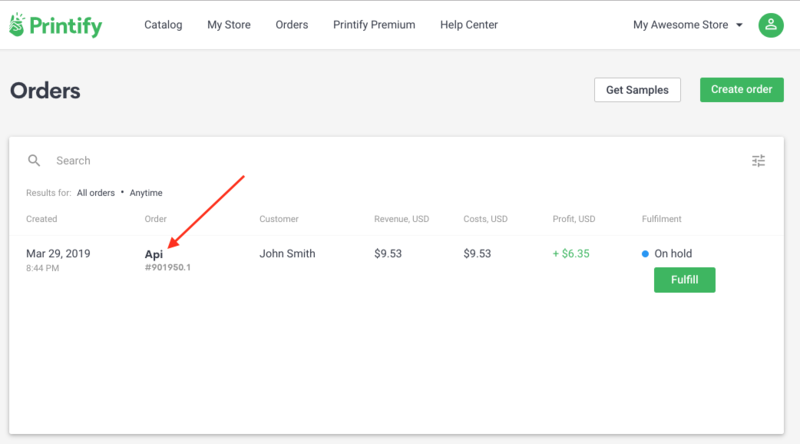 In both cases, you can easily edit the products straight from the order details. Please see the GIF below to see how such products would look like in your account and how to fix the images from the order details. 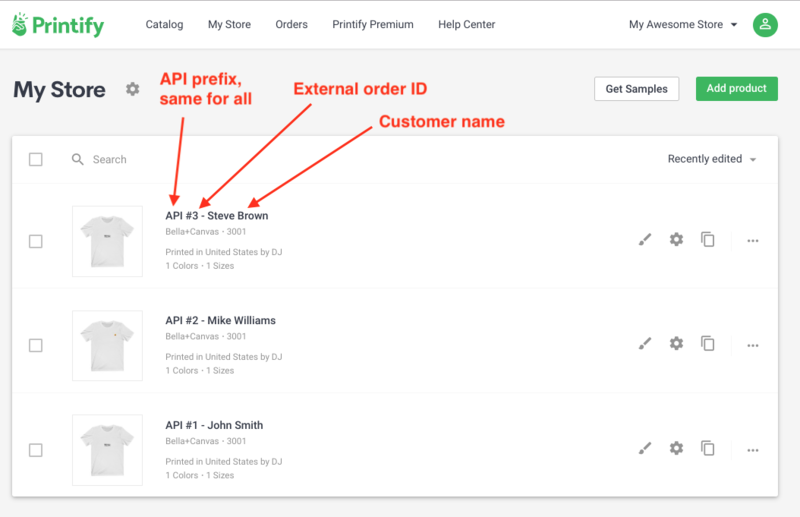 All products created through API during order submission follow the same naming convention. The product name always starts with an "API" prefix. After "API" follows the external order ID that was supplied during order submission (more in API Documentation). Lastly, the product title ends with the full customer name of that order.